A splendid show is on view until 15 January at the Gabinetto Disegni e Stampe of the Uffizi dedicated to Venetian drawings from the Ashmolean Museum and the Uffizi. 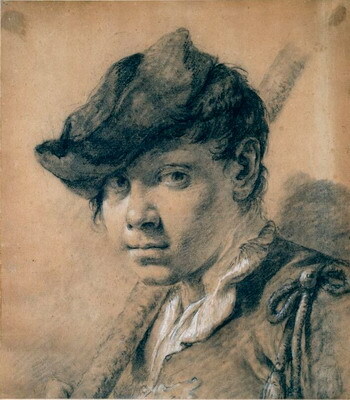 The dichotomy in the title of the show refers to the traditional opposition of the Tuscan figurative school, based on drawing, to the Venetian school focused instead on colour. This historiographical division is attributed to Vasari but has an older origin. In the Florentine bottega, drawing had always been considered a fundamental exercise, an authentic preparation for apprentices and a necessary preliminary to painting. It was Giorgio Vasari, in his work ‘Le vite’ [Lives of the Most Excellent Painters, Sculptors] who theorized in 1550 the supremacy of the Tuscan school based on drawing, the importance of line with respect to colour and criticised the Venetian painters for using theirrich polychrome technique to mask their limited expertise in drawing. In proposing a series of exceptionally beautiful drawings, the show categorically contradicts this theory. The drawings of the Venetian school, no longer necessarily considered preparatory studies, are autonomous and represent an unprecedented occasion to better understand, perhaps from a more intimate perspective, the great masters in the exhibition: Giovanni Bellini, Vittore Carpaccio, Titian, Lorenzo Lotto, Jacopo Bassano, Veronese, Tintoretto, Francesco Guardi, Canaletto, Piazzetta and Tiepolo. The less emphatic importance attributed to line – in the sense of clear contours or pronounced separation of areas – is compensated by a series of extraordinary pictorial effects that seem to cancel the distinction between the two techniques, drawing and painting. The group of eighteenth century drawings, with the chiaroscuro and light effects of Canaletto, Guardi, Piazzetta and Tiepolo are particularly fascinating and extremely modern in the extemporaneous strokes, the vaporous translucency and the synthesis of form. The Ashmolean Museum is named for Elias Ashmole, whose collection formed the first nucleus of what would become the heart of the museum system of the University of Oxford. The show is open 8.15 am – 6.00 pm, Tuesdays to Sundays, until 15 January. Closed Mondays. Dear reader, we bring you this article by Andrea Giordani with the compliments of the Uffizi Gallery in Florence you may follow this link for further info……. This entry was posted in Arts / LifeStyle / Travel and tagged Florence, Uffizzi. Bookmark the permalink.